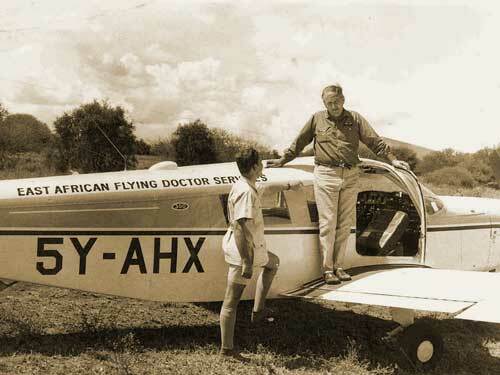 The Flying Doctors Society of Africa has a rich heritage and history, spanning the last 42 years. The Society was set up in 1971 by a group of like-minded individuals to raise funds for the work of the Flying Doctors in Africa. The Inaugural meeting of the Society was held on Monday, 23rd November, 1970, 5pm. Members present were Dr. Michael Wood (Chairing), Mrs Jack Block, Mrs J Leslie Melville, Dr. Anne Spoerry, Mrs Byron DeMott, Mr. Julian Larby, Mr. John Story; Apologies for absence from Mr. A. A. Moody Awori. In the meeting, Maddie exhibited samples of brochures, m/ship cards, badges, and tribal picture by Colonel Allen to be used in producing tribal prints for the membership. Officers elected were President – Mrs De ‘Mott, Vice President – Mr. Awori and Treasurer – Mr. Story. The official launch was proposed for mid January 1971. Mr. Patrick Orr of Morgan Orr & Associates coordinated the launch which was done in the Tate room of the New Stanley Hotel at 11:30am on Wednesday, 20th Jan, 1971. Among the attendees was the then Chairman of AMREF, Mr. Musa Amalemba who gave the speech at the launch; he was among the first members of the Society. He was followed by Hon Mbiyu Koinange, Minister of State and Hon Mohammed Jahazi, Minister of Health. Among cables from well wishers was that from Prince Bernard of the Netherlands and another from the Duke of Devonshire. Maddie De Mott was the first Chairman, President and Executive Officer of the Flying Doctors Society. In the early years, she was involved in the day to day running of the organisation including AMREF Outreach and Flying Doctors Service. Grace Wambui Kimuyu was employed by Mrs DeMott in 1971 as the first employee of the Society. By May 1971, 4 months after launching, the Society had raised KShs. 87,373.55, a princely sum in those days. The Society started selling Christmas cards in June 1971 as an additional income stream. The cards were printed by Lithographic Ltd. The first newsletter was designed on 12th May, 2011 by Maddie. Shortly afterwards, the Society opened a third income stream, tourist membership. The first Tour operators recruited for the tourist membership were , Gordon Harvey & Karl Pollman Safaris – 100 tickets, African Tours & Hotels – 50 tickets, Ellerman Safaris – 50 tickets, Ivory tours – 50 tickets and Touropa in Germany. By the end of 1971, 600 memberships has been sold, including 28 life memberships, 45 overseas memberships, 7 paid corporate memberships and 525 Annual East African memberships. The first evacuee was a hunter gored by a Buffalo between March 12th and April 19th 1971. The event was reported by Daily Nation with much persuasion by Morgan Orr. The second one was a woman tourist evacuated from Voi due to a grumbling appendix. The first corporate membership cost Kshs 5,300 and small companies complained so a sliding scale was suggested. It was suggested that companies with over 200 employees to pay 5,300, 100-200 to pay GBP 150 and under 100 to pay GBP 100 to be launched in 1972. The first corporate members included United transport overseas Ltd, So-far Investments, Kenya National Mills, Commercial Bank of Africa, Cooper Motors, East African Industries, Ker, Downey & Selby Safaris, East African Railways and Block Hotels. In a Council meeting held on 7th October, 1971, it was agreed that effective 1st Jan, 1972, corporate membership will be as follows: more than 175 employees, KShs. 5,300, less than 175 employees, KShs. 2,000. The first AGM of the Society was held on 3rd Feb 1972 5:30pm at the School of Nursing, Nairobi Hospital, and lottery held to sponsor a fundraising trip to Europe. KLM paid for the ticket. During the AGM, Ms De Mott presented Mr. Wood with the Society’s first donation to AMREF, which was KShs. 80,000. Maddie also announced receipt of Kshs 42,000 from Touropa through AMREF Germany. Total revenue for FDSA during its first year of operation was Kshs 232,180. Membership had risen to 1,359, broken down into 1,053 East Africa annual members, 126 juniors, 117 overseas members, 51 life members and 12 corporate members. In 1972, it was observed by Mr. Wood that “money for charities these days was not gained by straight donations but by the contributors receiving something in return”. The principle of fundraising by offering something in return has remained a core principle in FDSA’s fundraising efforts over the years. National offices were also actively supporting the work of FDSA even back then. The AMREF UK office was actively fundraising through UK schools in collaboration with OXFAM and BBC. It was also during this time that a decision was made concerning the channelling of donations through the Society instead of directly to AMREF. Mr. Wood suggested that donations should best go through the Society in order to coordinate the Society as one of the main local fundraising sources of the Foundation. FDSAs donations to AMREF more than doubled in the next year to KShs 180,000 with a total income of KShs 345,121 for 1972. Since then, donations to AMREF have grown by leaps and bounds. Since 1971, FDSA has contributed over KShs. 1 billion to support the work of AMREF and the Flying Doctors in Africa. The Society continues to play its role in being a leading contributor towards Better Health for Africa.